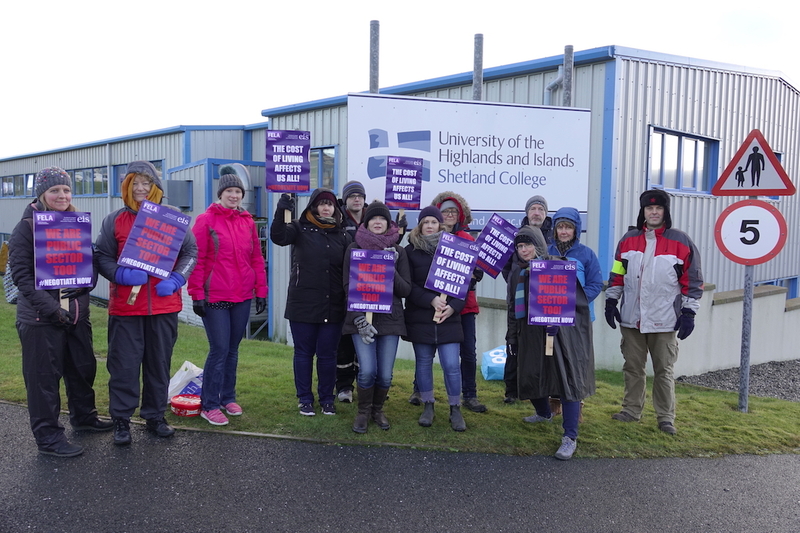 THE first of four days of industrial action saw Shetland College staff picket the entrance to the college at Gremista today. Around a dozen placard carrying staff protested to get what local EIS FELA branch secretary Andrew Anderson said was a fair wage settlement rather than the 2.5 per cent over three years offered by the Scottish Government. The union wants roughly three per cent per annum, or nine per cent over three years. According to Anderson, since negotiations started in 2016 the union has amended its claim a number of times with the present claim amounting to £425 for 17/18 and £1080 for 18/19 and 19/20. “It’s not an exorbitant claim we are putting in but management at the moment are not negotiating, though said they’d try and arrange a meeting for the end of January,” said Anderson. Though college staff are paid by the Shetland Islands Council, the money for any increase will come from the Scottish Funding Council. Anderson said that all union members had gone on strike though there were still a few non-union staff at work. He added that the action was being supported by the few students who turned up this morning and that staff would make arrangements to catch up on tuition that was being lost owing to the action. “Yes it will have some impact on students, but I do know the lecturing staff will do everything they can to minimise that,” said Anderson. The next planned strike is Tuesday 5thFebruary with two days planned for March. “It’s not an all out strike, it’s a sporadic strike aimed at putting pressure on the Scottish Government and to try and get management to return to the negotiating table. Chief executive of Colleges Scotland. Shona Struthers, said lecturers in Scotland were already the best paid in the UK. “It is extremely disappointing that the EIS-FELA is taking disruptive strike action for the third time in four years, especially when the colleges’ pay offer, combined with salary rises from the ‘same pay’ settlement, would see lecturers’ national average pay increase over three years by 12.2 per cent, which is a cash increase of over £5,083,” she said. “This offer on the table is the best overall pay rise for public sector workers anywhere in the UK, but the EIS-FELA want even more. “At the heart of this dispute is the EIS-FELA’s refusal to recognise the substantial pay increases awarded to most lecturers from the previously agreed ‘same pay’ deal represent a pay rise.